AlphaNinja: Could the USA be in worse financial shape than California? Could the USA be in worse financial shape than California? Alphaninja - No, is my answer - because the nation's revenue base (taxes) is more spread out and less volatile than California's. But the deficit-to-GDP numbers are FAR worse for the country as a whole. I don't try to get political here - but when the USA is adopting California's policies (climate, etc.) that chase business from the state, while attempting to sell debt to foreigners based on that ever-weakening economy, I worry. "...suggests that the U.S. government’s fiscal situation is in worse shape than California’s. The deficit relative to gross domestic product for the entire U.S. this year is 12.9 percent, according to White House estimates released last month. 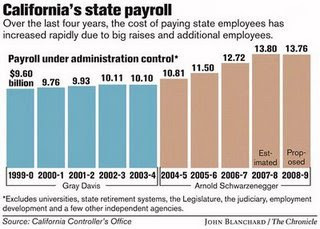 If California had the same deficit relative to its GDP, it would be short about $230 billion -- 10 times the size of its current shortfall." "California is asking for a federal guarantee of their debt, because they are cash strapped and don't want to pay the extra money investors are demanding. As they face a 33% shortfall in revenues and expenditures, they have a lot of work to do." "State spending in the past two decades......has increased 5.37 percent a year (and nearly 7 percent for the past decade), compared to a population-plus-inflation growth rate of 4.38 percent. If the budget growth rate had been limited to the population-inflation growth rate, the state would be sitting on a $15 billion surplus right now." Talbots sells J.Jill, locks in a huge loss. You sir, are an IDIOT.